I really like the idea of long, wavy, flowing hair. Whether it's because summer is approaching or as I'm getting a little older, I'm becoming more relaxed and happy within myself and my style and I don't feel I have to comform to any particular trends or followings. When I was flying I had my hair cut and coloured regularly, as it was part of the job to look neat and presentable at all times, so lately I'm feeling slightly rebellious that my blonde is growing out and quite frankly my roots look awful! But, I'm weirdly liking it! After my disastrous haircut in the summer, where the hairdresser made me look like a bright blonde mushroom, I haven't been brave enough to return to the chair! I have though, booked a hair appointment at a salon in Spain, that's run by English girls, so I have full faith in them, that there's not going to be any language barriers or misunderstanding and a simple trim means a simple trim. I've always had blonde highlights and a couple of times over the years I've completely changed and gone dark brown, but I don't think it suited me. Whether I was lacking a suntan I'm not sure, but the colour didn't seem to suit my complexion, even though brown is my natural colour. I love all the ombre shades I'm seeing at the moment, but Ive decided to let my blonde grow out a bit more and give it a break from constant colouring and dyes. 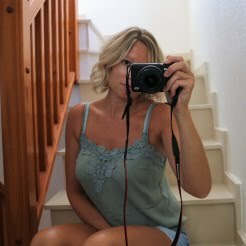 I'm sure I will end up back with the blonde highlights, but at the moment I am enjoying being a bit more natural and having time to decide what colour I would really like. Some pictures I've found on the web for ideas and inspiration.